The Scottish government has put forward its blueprint for independence in a white paper published this morning. AN INDEPENDENT SCOTLAND would cut its corporation tax rate, take-on £1.3 billion in debt from the UK, keep the sterling and stay in the European Union, according to a white paper published today. The Scottish government has this morning published its blueprint for independence ahead of a referendum next year where voters will be asked: “Should Scotland be an independent country?”. 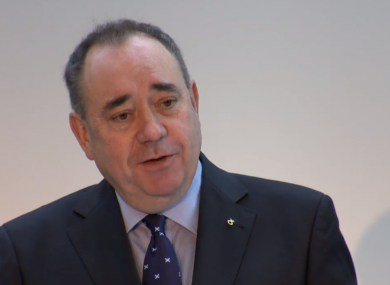 “Scotland’s future is now in Scotland’s hands,” the regional government’s First Minister and Scottish National Party leader Alex Salmond told a packed press conference in Edinburgh this morning. Among the most eye-catching proposal is for corporation tax to be cut by three per cent to 21 per cent, while Scotland would also retain the sterling and remain in the European Union. The First Minister repeatedly faced questions this morning as to whether the Bank of England, the EU, and other organisations and countries would agree to the changes being proposed in the document. The government estimates that the independent country would inherit £1.3 billion of debt from the UK, but it would look to offset this against its share of assets. Asked how much independence would cost the average Scot, Salmond claimed that Scottish people would have been £2,400 better off had the country controlled its own finances over the last five years. Other eye-catching measures that the SNP has pledged to implement include cutting air passenger duty in half, cutting energy bills, abolishing the controversial so-called ‘bedroom tax’ and extending free childcare to 30 hours per week. Scotland would also ‘eject’ the Trident nuclear programme from the region “as soon as is safely possible”, according to deputy first minister Nicola Sturgeon. The white paper also contains a proposal to scrap the BBC and set up the Scottish Broadcasting Service, SBS, which would still retain BBC programming. Salmond said that Scotland would retain “a share of the assets” of the BBC, as would be the case with other bodies, meaning viewers would not miss out on popular programmes like Dr Who and Strictly Come Dancing. The 670-page document sets out the blueprint for Scotland breaking from the UK after 300 years of union and proposes that Scotland would become independent on 24 March 2016 if the referendum passes. Current polls show that only one third of the 5.3 million Scots are currently in favour of breaking away from the UK. The Scottish government hopes the white paper will sway the argument. Speaking at a packed press conference today, Salmond said that the choice was now down to Scottish voters and that the white paper was the programme his party is proposing to implement if voters opt for independence. “Unless we’re independent we won’t have the ability to make these choices,” he said. Poll: Should Scotland vote for independence? Email “Independent Scotland would 'cut corporation tax, keep sterling, stay in EU and scrap the BBC'”. Feedback on “Independent Scotland would 'cut corporation tax, keep sterling, stay in EU and scrap the BBC'”.